I, too, may one day become "better organized." 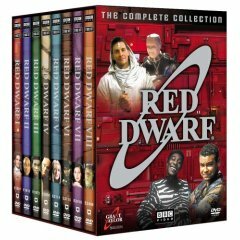 Watched the Gems in the supplemental DVD of Red Dwarf Series 3. Series 2 of Red Dwarf is excellent. Finished Time and Materials: Poems 1997-2005 (poetry) by Robert Hass. You will be quiet too. The birds fall silent in the woods. You too will be silent. Read Geography III (poetry) by Elizabeth Bishop. Read A Cold Spring (poetry) by Elizabeth Bishop. Read North and South (poetry) by Elizabeth Bishop. Abandoned listening to Shrink Rap by Robert B. Parker. A boring quote-thriller-unquote by an author who thinks lap dogs are more important than people. Finished listening to The Elusive Mrs. Pollifax (1971) by Dorothy Gilman, read with some terrific Bulgarian accents by Barbara Rosenblat. One of the first and a really excellent "cozy" spy thriller. The glory days of amateur spies triumphing for a democracy that meant moral freedom as opposed to the freedom to buy consumer goods. Dipped into one last time before releasing Loneliness and Time: The Story of British Travel Writing by Mark Cocker. Includes the travels and opinions and actions of: Richard Burton, F. M. (Eric) Bailey, Robert Byron, Bruce Chatwin, Lawrence Durrell, Patrick Leigh Fermor, T. E. Lawrence, David Livingstone, Gavin Maxwell, Alan Moorehead, Geoffrey Moorhouse, Jan Morris, H. St.J. Philby, J. H. Speke, H. M. Stanley, Freya Stark, Wilfred Thesiger, Laurens van der Post, and Francis Younghusband. Reread the delightful Serious Concerns by Wendy Cope. Abandoned attempt to strengthen background for my NaNoWriMo 2007 project by struggling through Ancient Greek (a Teach Yourself Complete Course) by Gavin Betts and Alan Henry. Unit One (1) and Unit Two (2) were commented on last December. Time to return to library. Dipped into As Above, So Below: A Novel of Peter Bruegel by Rudy Rucker. A lightweight read so returned it quickly to library. Completed Sick Puppy by Carl Hiaasen. Well! I was promised "p-o-r-n-o for liberals" and was not disappointed. What a joy-ride of Solomon-esque justice upon the avaricious, the mean, the Republican. The nature and intensity of the story made it and appropriate bathroom book for the last couple of months. The only act that can follow this is another Hiaasen book, Skinny dip, it turns out. Finished Life Class (2007) by Pat Barker. What a pleasure to read. So well written, and rather a contrast in writing with light-weight detective novels like The Three Evangelists and with complex experimental fiction like Peter Høeg's The Quiet Girl. First Friends by Ronald Blythe. Interior Landscapes: A Life of Paul Nash by James King. Mark Gertler by Sarah MacDougall. C.R.W. Nevinson: The Cult of Violence by Michael J.K. Walsh. Isaac Rosenberg, Poet and Painter by Jean Moorcroft Wilson. Henry Tonks: Art and Surgery by Emma Chambers. A Diary Without Dates by Enid Bagnold. The Forbidden Zone by Mary Borden. Chronicle of Youth: Great War Diary 1913-1917 by Vera Brittain, edited by Alan Bishop. The Backwash of War by Ellen N. La Morte. Gentlemen Volunteers by Arlen J. Hansen. Doctors in the Great War by Ian R. Whitehead. The Katherine Mansfield Notebooks edited by Margaret Scott. Ottoline Morrell by Miranda Seymour. The Enemy in Our Minds: Germans in Britain During the First World War by Panikos Panayi. Read Section 6 on Sylvia Plath in The Wounded Surgeon by Adam Kirsch. Read Section 5 on Delmore Schwartz in The Wounded Surgeon by Adam Kirsch. Finished listening to Suspect by Michael Robotham. Read by Simon Prebble, whose voice does not do the book justice because he unfortunately swallows his consonants, making it hard to understand at low volume. Robotham's second book in this series, Lost, was by contrast brilliantly read (actually 'performed') by Ray Lonnen, including wonderful north-country (English) accents. In Suspect, psychiatrist Joe O'Loughlin appears to have been framed, though it takes almost the whole book to sort things out. Joe's experience in being pursued relentlessly by D.I. Vincent Ruiz (the protagonist of the second book, Lost) makes it both surprising and inevitable that Joe is convinced of Ruiz innocence and so determined to help him. Some excellent cameos, including Joe's Dad. Should be a movie! Finished The Three Evangelists (2006) by Fred Vargas (translated (clunkily in places) by Siân Reynolds). A pleasant relaxing Saturday book. Dedicated to the author's brother. Not as good as the quick-off-the-starting-line energy and quirkiness and interest of Seeking Whom He May Devour (1995 in France; 2007 in USA); delightfully translated by David Bellos. A little better than Wash This Blood Clean From my Hands (2004 in France; 2007 in USA); clunkily translated by Siân Reynolds. Finished The Quiet Girl by Peter Høeg. "they said ... the rest of my life might be very short. They closed two doors before they said that, but I heard them anyway." ... "I heard the hospital, the trip home, the car, the winter quarters, as I've never heard it before. It wasn't just the physical sounds; it was their context. ... And for the first time I heard some of the world alive, unfiltered, unmuted." The part of the story about a dozen children with super-powers (such as causing 'earthquakes' in a localized region of Denmark) is complex and muddled. The world's physical beauty of his best book, Miss Smilla's Sense of Snow is also missing. Steep gasoline prices and the weak economy are beginning to curb Americans' gas-guzzling ways. In the past six weeks, the nation's gasoline consumption has fallen by an average 1.1 percent from year-earlier levels, according to weekly government data. Investors piling money into commodities as a refuge from inflation helped push oil prices Monday above their inflation-adjusted record of $103.76 a barrel, set in 1980. Finished Fog and Brittle Pine, the 2007 anthology of the Yuki Teikei haiku society. Includes my honorable mention in the 2007 Kiyoshi and Kiyoko Tokutomi Memorial Haiku Contest plus two of my haiku. Finished listening to Lost by Michael Robotham. Brilliantly read (actually 'performed') by Ray Lonnen. Wonderful north-country (English) accents. The story has a very confusing start, which would have been helped had I read Suspect, the previous book in this series, where D.I. Vincent Ruiz (the protagonist of Lost) appears with Psychiatrist Joe O'Loughlin (the patient friend and advisor to Ruiz). Lost makes heavy use of coincidence and obsession. While it is well-recommended, it is better listened to than read. Re-read Issue 39.3 (Autumn 2008) of Modern Haiku. a system of evaluation simple enough to be used by newbies, but powerful enough to apply to the work of masters. ... [It includes] a rating system ... [with] a scale laid out in three parts -- one each for the three elements -- form, content, and style -- with a bonus section for special considerations. It is possible to score from zero to three points in each part -- zero for not using an element or using it incorrectly, one for ordinary usage, two for usage that has a significant impact on the poem, and three for usage that has a significant impact on the genre." He illuminates this system by applying it to several haiku, most usefully to a haiku in Japanese (by Basho), to which he assigns 8 points, and its translation into English by R.H. Blyth. to which he assigns 4 points. Acquire and use of the element of form. Acquire and use of the element of content. Acquire and use of the element of style. "Poets at this level must be aware of how their efforts will affect their readers and listeners." Find "the form that serves each poem best. ... The sole purpose of form is to deliver the poem most effectively to the audience." "Move beyond ... inherited content and into personal content out of our own lives." "Moving from the imitative to the evocative is exactly what the fifth level is about." Incorporate "practice into the subconscious". American haiku poets don't grasp the idea that the shadow has to have risen up and invaded the haiku poem, otherwise it is not haiku. Quoting Bly's Little Book of the Shadow. Watched the Gems in the supplemental DVD of Red Dwarf Series 2. Read Section 4 on Randall Jarrell in The Wounded Surgeon by Adam Kirsch. Read Section 3 on John Berryman in The Wounded Surgeon by Adam Kirsch. Read Section 2 on Elizabeth Bishop in The Wounded Surgeon by Adam Kirsch. Read Section 1 on Robert Lowell. in The Wounded Surgeon by Adam Kirsch. Viewed a brilliant DVD: F for Fake (1972), Orson Welles last complete film "gleefully engages the central preoccupation of his career -- the tenuous line between truth and illusion, art and lies. ... an inspired prank and a searching of the essential duplicity of cinema." The cuts are stunningly excellent. The extras are rich, particularly Orson Welles: One-Man Band (1995) on his unfinished projects and Almost True: The Noble Art of Forgery (1997), an actual documentary about the art forger who Welles includes in F for Fake. Completed If Not, Winter, the Sappho translations (with an essay) by Anne Carson. Read the Sappho translations (a quarter of the book) and essay portion of 7 Greeks translated with an essay by Guy Davenport. Lizzie Widdicombe's "INK: Say It All In Six Words" in The New Yorker (25 February 2008, pp. 7-8) is a delight. She quotes from a new book called "Not Quite What I Was Planning", describing it as "a compilation of teeny tiny memoirs". Each entry is someone's life story in six words, submitted to SMITH magazine's "Your life in six words competition". One of my favorite entries is: "Canoe guide; only got lost once". At the book party (cookies and beer) sticky notes and markers invited people to "Write your memoir on your nametag!" One was most quintessential among equals: "Former child star seeks love, employment". The winner, whose memoir was used as the book title, thought it was a scam when she received email: "Your contest entry has been chosen". Mine could be "I could spend a lifetime brainstorming". Now, this is the way we give then the water cure. ... Lay them on their backs, a man standing on each foot, then put a round stick in the mouth and pour a pail of water in the mouth and nose, and if they don't give up pour in another pail. They swell up like toads. I'll tell you it is terrible torture. "Ultimately outraged dissenters ... Herbert Welsh -- forced the question of U.S. atrocities into the light." But in the end: "As the investigation of the water cure ended and the memory of the far-away torture faded, Americans answered it with their silence." Michael Specter's "Big Foot: In measuring carbon emissions, it's easy to confuse morality and science". Includes a note that: "Bishops of the Church of England have just launched a 'carbon fast,' suggesting that during Lent, parishioners, rather than giving up chocolate, forgo carbon. (Briton's generate an average of a little less than ten tons of carbon per person each year; in the United States, the number is about twice that." Scientists at the Stockholm Environment Institute reported that the carbon footprint [as opposed to the Ecology Footprint] of Christmas -- including travel, lighting, and gifts -- was six hundred and fifty kilograms per person. That is as much, they estimated, as the weight of 'one thousand Christmas puddings' for every resident of England. Researchers at Lincoln University in Christchurch found that lamb raised in New Zealand and shipped eleven thousand miles by boat to England produced six hundred and eighty-eight kilograms of carbon-dioxide emission per ton, about a fourth the amount produced by British lamb. In part that is because pastures in New Zealand need far less fertilizer than most grazing lands in Britain (or in many parts of the United States). Similarly for New Zealand apples. Interviews Richard Sandor, who "invents markets to create value for investors where none existed before ... who believes that free markets can make inequality disappear" and who had early success in the late 1980s with advocating the creation of an exchange for sulfur-dioxide emissions. We need to address the problems that exist, not drown in fear or lose ourselves in morality. Behavior changes when you offer incentives. ... Our problem is global warming, and my job is to reduce greenhouse gasses at the lowest possible cost. I say solve the problem and deal with the bad guys somewhere else. "Killing Joke: The Coen brothers' twists and turns" (pp. 72+) by David Denby on their movie of No Country For Old Men and the rest of their work. "anchoring", where price is determined not by supply and demand but by a tide-lifted list of prices. "endowment effect", where people that have won something (like a sought-after game ticket) will not accept less for it than the most someone wanting that thing is willing to pay. "FREE! ", where someone makes a less advantageous decision purely because that includes something trivial without explicit charge. Listened to Invisible prey (2007) by John Sandford (Pulitzer prize-winner John Camp), read by Richard Feronne. Detective Lucas Davenport is slowing down and also less funny than he used to be His wife, Weather, is insightful in seeing connections before Lucas. Still, as always, Lucas gets his serial killer. Finished Wash This Blood Clean From my Hands (2007) by Fred Vargas (translated by Siân Reynolds). A pleasant relaxing Saturday book. Dedicated to the author's twin; in the book, the protagonist, Jean-Baptiste Adamsberg, rediscovers his twin. But the book lacks the quick-off-the-starting-line energy and quirkiness of (and is less interesting than) Seeking Whom He May Devour by Fred Vargas. Oh, I transfer stuff, I balance it up, I share it out. 'Is that a problem?' asked Josette, seriously. A cute response, but in terms of the novel, it is. To kill, you need to be emotionally involved with other people, you need to get drawn into their troubles and even be obsessed by what they represent. Killing means interfering with some kind of bond, an excessive reaction, a sort of mingling with someone else. So that other person doesn't exist as themselves, but as something that belongs to you, that you can treat as a victim. While I agree with the last sentence, I'm doubtful that such criminal behavior is always generated from emotional involvement. Crimes of passion, yes. But not for the more cold-blooded crimes of business, such as by Chigurh in No Country For Old Men. though it has considerable competition. Completed listening to The Foundations of Western Civilization: Part II by Thomas F.X. Nobel. Opera: Gilbert and Sullivan's Iolanthe. Read Night of a Thousand Blossoms by Frank X. Gaspar. I like many of his poems, admire his willingness to use words not usually in poetry, and enjoy both his frequent "pathetic fallacies" and his complete indulgence in adjectives. For NaNoWriMo 2007 project, finished dipping into one of the last books borrowed from the library in the autumn: The Sappho Companion edited and introduced by Margaret Reynolds. For NaNoWriMo 2007 project, finished The Love Songs of Sappho translated with an essay by Paul Roche. Read the redwood forest for the flower and banana slug survey. HAPPY SUPER TUESDAY -- VOTE! Finished listening to Our Endangered Values: America's Moral Crisis by Jimmy Carter, read by the author. Details specific problems with the policies and actions of George W. Bush and his administration. Excellent material. Sadly, Carter's voice is less clear than that of most readers of Recorded Books; he does not do full justice to his own material, and a more clear reader would be better. Abandoned The Truth About Celia (2003) by Kevin Brockmeier. What a disappointment. I now abandon all hope (after attempting three of his books) that he can write anything up to his The Brief History of the Dead (2006), one of the best books read in 2007. Maybe Celia is a blurry exploration of the ideas that later become The Brief History of the Dead. Finished Seeking Whom He May Devour (2006 in USA) by Fred Vargas. A quirky and enthralling French noire thriller. A lot of off-stage gore and violence, and the amazing normalcy and abnormal bravery of some very eccentric characters. Some of the characters may be related to Smilla (Smilla's Sense of Snow), who put her faith in Euclid's Geometries. In particular, the heroine Camille is calmed by and draws "her vital energies from two sources: musical composition and The A to Z of Tools for Trade and Craft". The Waters of Liffey provided a first-rate solution to his dilemma. The only people in the bar were noisy, boozy Irishmen speaking what was for Adamsberg a completely hermetic tongue. ... In this precious hidey-hole Adamsberg spent many an hour dreaming away, peacefully waiting for ideas to rise to the surface of his mind. Too wonderful or too poetical to be true. When poetry bursts into real life you may be amazed and delighted, but it is never very long before you see that you have been had by a con or a scam. "Watch it," Watchee went on, with a glance at Soliman. "We're sharing the lorry with the young lady. Behave respectably, and with respect to her." He dismissed Adamsberg with a brief nod and climbed back into the lorry. "Hospitality," said Soliman. "'Reception and entertainment of guests with liberality and goodwill.'" And for one of the best description of true love, see p. 267 for Adamsberg's "looney drainage system". Finished watching the two-DVD multi-part Masterpieces of the Hermitage Museum of St. Petersburg which tells the history of the museum, from its establishment by Peter the Great, and leads us through the collection from ancient China, Egypt, Greece, and Rome to the masterworks of the European painters: da Vinci (with his amazing new 'smoky' technique for skin tones), Rembrandt, Raphael, el Greco, Matisse, cubist Picasso, and hours more. All the joy of spending a couple of days in the museum, without the crowds or the sore feet, and with a personal art historian as your guide. Finished dipping into the illustrated Introducing Aristotle Rupert Woodfin. Finished dipping into the illustrated Introducing Plato by Dave Robinson. For NaNoWriMo 2007 project, finished listening to The Odyssey by Homer translated by George Herbert Palmer (1884) and read by Norman Dietz. Very powerful translation that stands up well through the century. Better than the Flagels translation. For NaNoWriMo 2007 project, finished dipping into Classical Mythology: An Alphabetic Guide (The Meridian Handbook of) by Edward Tripp. Discussion by Rob Grant, Doug Naylor, and Ed Bye of the whole history of bringing Red Dwarf to TV. Discussion by cast, Doug Naylor, and others of the adventure of making Series 1. Wonderful additions of smeg-ups, unbroadcast scenes, etc. To strengthen background for my NaNoWriMo 2007 project, From Alpha to Omega, An Introduction to Classical Greek by Anne H. Groton: finished Chapter 7: "Second Declension: Masculine Nouns.". For NaNoWriMo 2007 project, finished dipping into Ancient Greek, Roman, and Byzantine costume by Mary Houston. Finished listening to Digging to America by Anne Tyler. A peaceful story of the assimilation of Iranians and adopted Korean baby girls into the culture that previous generations (primarily from Europe) have created as 'American'. For NaNoWriMo 2007 project, finished dipping into Ancient Greece by Don Nardo. Completed Red Dwarf: Better than Life by Grant Naylor. Finished dipping into the detailed Keats (1999) by Andrew Motion. Documents Keats' life and how Keats 'rejects romantic pleasure for "posterity's award"' [p. 103]. The book is particularly rich in the "social and political contexts in which Keats came to maturity". The main weakness of the book is an ambiguity of time and sometimes pronoun. This could have been helped by a timeline. Often, the ambiguity of time arises from the detail through Motion's book, such as when he includes three different dates in a paragraph, and then says something like "that November", which is now ambiguous. Sometimes it is because Motion is assuming the reader will read this book linearly. But a book with a very helpful 23 pages of tiny-font index is intended more as a text to be referenced. Lord Byron (George Gordon Byron) (13 lines). Keats: brother George (34 lines). Keats: brother Thomas (27 lines). To strengthen background for my NaNoWriMo 2007 project, From Alpha to Omega, An Introduction to Classical Greek by Anne H. Groton: finished Chapter 6: "Ω-verbs: Future Active Indicative, Future Active Infinitive". Finished reading much of the fascinating Coleridge by Walter Jackson Bate. Also finished dipping into the more pedestrian Coleridge: a collection of critical essays edited by Kathleen Coburn. Finished Don Juan by Lord Byron (George Gordon Byron). To strengthen background for my NaNoWriMo 2007 project, From Alpha to Omega, An Introduction to Classical Greek by Anne H. Groton: finished Chapter 5: "First Declension: Feminine Nouns, Part 2". Assigned next 12 words to learn; total 22 words. Finished Red Dwarf: Infinity Welcomes Careful Drivers by Grant Naylor. Finished listening to Mrs. Pollifax on the China Station by Dorothy Gilman. Opera: Gilbert and Sullivan's Ruddigore. To strengthen background for my NaNoWriMo 2007 project, From Alpha to Omega, An Introduction to Classical Greek by Anne H. Groton: finished Chapter 4: "First Declension: Feminine Nouns, Part 1". Assigned next 12 words to learn; total 22 words. 2004 winner of Permafrost Chapbook contest: The Nightmare Parable by Do Gentry. To strengthen background for my NaNoWriMo 2007 project, From Alpha to Omega, An Introduction to Classical Greek by Anne H. Groton: finished Chapter 3: "Ω-verbs: Present Active Indicative, Present Active Infinitive, and Present Active Imperative". Assigned first 10 words to learn. The self-published 2007 poetry chapbook The Last Days by Dane Cervine. Finished No Country For Old Men by Cormac McCarthy. A lot of the time ever when I say anything about how the world is goin to hell in a handbasket people will just sort of smile and tell me I'm gettin old. That's one of the symptoms. But my feelin about that is that anybody that cant tell the difference between rapin and murderin people and chewin gum has got a whole lot bigger of a problem than what I've got. Forty years is not a long time neither. Maybe the next forty of it will bring some of em out from under the ether. If if aint too late. I think if you were Satan and you were settin around tryin to think up somethin that would just bring the human race to its knees what you would probably come up with is narcotics. Maybe he did. I told that to someone at breakfast the other mornin and they asked me if I believed in Satan. I said well that aint the point. And they said I know but do you? I had to think about that. I guess as a boy I did. Come the middle years my belief I reckon had waned somewhat. Now I'm startin to lean back the other way. He explains a lot of things that otherwise dont have no explanation. Or not to me they dont. I always thought when I got older that God would sort of come into my life in some way. He didnt. I don't blame him. If I was him I'd have the same opinion about me that he does. You dont know what he thinks. And sometime the next night I come to an American position and that was pretty much it. I thought after so many years it would go away. I dont know why I thought that. Then I thought that maybe I could make up for it and I reckon that's what I have tried to do. You end up layin a lot things at your own door that you didnt plan on. If I was supposed to die over there doin what I'd give my word to do then that's what I should of done. ... I didnt know you could steal your own life. And I didn't know that it would bring you no more benefit than about anything else you might steal. I think I done the best with it I know how but it still wasnt mine. It never has been. You can say you like it or you dont like it but it dont change nothin. I've told my deputies more than once that you fix what you can fix and you let the rest go. If there aint nothin to be done about it it aint even a problem. It's just a aggravation. To strengthen background for my NaNoWriMo 2007 project, finished Chapter 2: "Introduction: The Greek Accents" in From Alpha to Omega, An Introduction to Classical Greek by Anne H. Groton. Haiku Humor: Wit and Folly in Japanese Poems and Prints by Stephen Addiss with Fumiko and Akira Yamamoto. Humorous haiku are now called senryū, to distinguish these jokey little poems, often targeting their mirth on someone else, from the more austere and inward haiku. Some western groups differentiate them strongly, while others (in acknowledgment of their sometimes fuzzy boundary) do not; the premier USA journals Modern Haiku and The Heron's Nest do not currently differentiate. Dipped into On Writing Well (5e, 1994), by William K. Zinsser. To strengthen background for my NaNoWriMo 2007 project, finished Chapter 1: "Introduction: The Greek Alphabet" and 'read' a story in Greek by Aesop in From Alpha to Omega, An Introduction to Classical Greek by Anne H. Groton.